Running Press Adult, 9780762457359, 272pp. Journalist Amy Haimerl and her husband had been priced out of their Brooklyn neighborhood. Seeing this as a great opportunity to start over again, they decide to cash in their savings and buy an abandoned house for 35,000 in Detroit, the largest city in the United States to declare bankruptcy. As she and her husband restore the 1914 Georgian Revival, a stately brick house with no plumbing, no heat, and no electricity, Amy finds a community of Detroiters who, like herself, aren't afraid of a little hard work or things that are a little rough around the edges. Filled with amusing and touching anecdotes about navigating a real-estate market that is rife with scams, finding a contractor who is a lover of C.S. Lewis and willing to quote him liberally, and neighbors who either get teary-eyed at the sight of newcomers or urge Amy and her husband to get out while they can, Amy writes evocatively about the charms and challenges of finding her footing in a city whose future is in question. Detroit Hustle is a memoir that is both a meditation on what it takes to make a house a home, and a love letter to a much-derided city. Amy Haimerl is a professor of journalism at Michigan State University and covers small business and urban policy for Fortune, Reuters and the New York Times. She was the entrepreneurship editor at Crain's Detroit Business, where she covered the city's historic bankruptcy trial. She is an alum of Fortune Small Business, CNNMoney and USAA Magazine, as well as a former Knight-Wallace Fellow at the University of Michigan. She lives in Detroit with her husband, Karl; two pitbulls, Maddie and Beaubien; and stray cat, Jack, who is the boss of everyone. This memoir of home renovation in Detroit delves into much more, including the importance of place, the meaning of urban revival and the building of lives and loves. "An engaging and cautiously optimistic memoir of making a new life." "The amazing charm of Detroit Hustle by Amy Haimerl is its brilliant use of concurrent narratives - one quite personal, one about a down-on-its-luck city trying to get up off its knees - to show how perseverance, community and love are so essential to both stories. Each chapter has you rooting for the city, but also cheering for the writer and her husband, their neighbors and family, and the expansive house renovation project whose journey, hiccups and all, makes them into Detroiters." 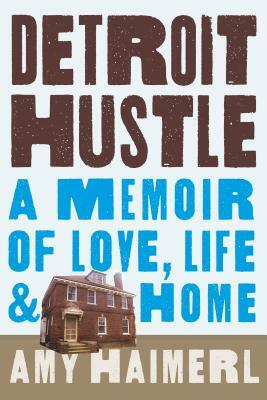 "Detroit Hustle is much more than a book about restoring a house. It's about a city and its people abandoned to the churn of change, about fitting in and standing out, about decades of decay and wispy hopes of revival. It's America's story. Amy Haimerl's memoir is as gritty and gripping as Detroit itself."